Looking for a box to house two 8" subwoofers? 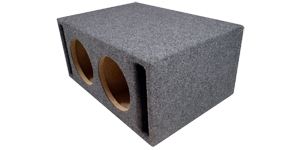 We stock high quality dual 8" vented / ported subwoofer boxes that work with most subwoofers. A vented / ported design will provide lots of booming bass. If you are looking for a high quality subwoofer box look at our selection below.